When we think of stress we immediately think of working long hours, crazy schedules, and a chaotic house full of kids. 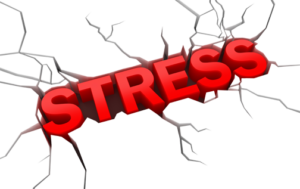 Yes, these are all types of stress; however, our body cannot decipher between what we think is good stress and bad stress. We look at things like going to the gym, going for a run, or taking the family on a vacation to relieve stress, when, in fact, it is still stress. Our bodies just know that something is going on and it needs to do its job of creating homeostasis, keeping everything stable at the internal level. Stress is the immediate disruptor of stability. When we become stressed, good or bad, our body releases a hormone called cortisol; also known as the stress hormone. It is very important you take the time to manage your stress. It should be part of your daily routine. You can do everything else right, but if you aren’t managing your stress daily, your progress and health will deteriorate. If your goal is weight loss, managing stress might be the most important factor. Here are some great ways to manage your stress and these should be part of your daily routine. Meditate: this has been an absolute game changer for me. 5 minutes of meditating can have a profound impact on your day. I like to do a 15-minute session every day. If you are unsure how to do it, there are some guided meditation apps you can download, i.e. Headspace is one I began with. I cannot recommend meditation more, it will change your life. Gratitude: Be grateful every day for the things you have. Keep a “Gratitude Journal” and write 3 things every day that you are grateful for: your health, your family, your job, etc. This will help you realize the things you cherish in life and will give you meaning. Learn To Say “NO”: This is very hard for me, and anyone who wants to please and help people. Too many times we think we need to say yes to everyone and everything. The problem is, saying yes will eventually rob you of your personal and family time. Obviously, you must weigh the options of saying yes or no, but don’t feel like you have to say yes just to please someone, because ultimately you are just causing yourself more stress. Cut Negativity Out Of Your Life: If you are around a negative environment, Get out! You need to remove negativity from your life. It might be friends, coworkers, even family, whomever or whatever it is, get rid of it if you want to reduce stress. We all know the people who just want to speak ill of others, or everything is doom and gloom and they are the victim of a cursed life, they need to go or at least keep them at a distance. Get Outside: Spend some time outside, whether it is going for walk, taking the dog for a walk, or just sitting on the front porch: and not with your cellphone. There is a sense of peace when you are out in nature, not to mention the benefits of natural sunlight. We as humans, are meant to spend time in the outdoors. Cut the To-Do List: I know most of us are products of To-Do Lists, but they easily turn into To-Don’t Lists. Writing things down give us a sense of accomplishment, but most times these lists turn into a novel of things that are never going to get done. How many times have you written a list, gotten overwhelmed and a few things (or nothing) gets done? I like to use a Priority List. I write 3 things down, just 3 things that are of absolute priority for me to get done. It’s not a traditional to-do list. I don’t write things like, make the bed. Making your bed should be an automatic habit, not part of a checklist. Write a blog: I do this first thing in the morning because this way, if the day goes haywire, I at least accomplished this. Do 1 thing to move my business forward: I may put a business media post up, send emails, etc. Basically, things to help progress my business in any way possible. Spend time with my family: This is usually toward the end of the day when they are finished with their day as well. It might be watching tv, a movie, talking, playing catch, etc.If I can accomplish these 3 things in a day, it is a success. It is a lot better than making a to-do list of 10 things and getting nothing done. You may need lists to remind you of things, like making doctors’ appointments, but don’t become obsessed with them. Pick 3-5 Daily Priorities and get them done. Ditch the Phone: Pick specific times when to put your cellphone away or turn it on Airplane Mode. We have become obsessed with phones and staying connected. Instead of just aimlessly bouncing back and forth between apps (Facebook, Instagram, Twitter), get rid of it and spend some quality time with family, friends, or reading a book. How many times have you gone onto Facebook and see something that fires you up. I know it happens to me, but if I don’t see it, it won’t stress me out. Read a Book: Reading books, is becoming a lost art today. There is nothing more relaxing than sitting down with a book and getting lost in it for a little while. I read every day. I read 10 pages (20 minutes) of a book that has to do with business, training, etc. Basically, something that is a tough read or not the most appealing but beneficial. Then I read 10 pages (20 minutes) of a book that I want to read. Listen to the Piano: It doesn’t have to be the piano but listen to music that relaxes you. I’ll pop in my headphones when I take my dog for a walk and just listen to piano music or jazz. This helps relieve stress and put you in a calm state of mind. You can significantly relieve your stress levels by employing some of these methods during your day. Most of these can become a routine of sorts and help you with daily production. You will notice when you start doing some of these things, your complete being will change. As I stated earlier in this blog, if I could pick just one thing to do to release stress, it would be Meditation. I hope these suggestions help you become stress free and more productive in your life.